NETGEAR’s family of Prosafe® Gigabit Smart Switches is purposely designed for SMB customers with high performance, SMB-oriented features and easy management. With 8 10/100/1000 Mbps ports, each capable of powering 2000 Mbps of data throughput in full-duplex mode per port, the GS108T is an ideal solution for extending network connections into conference room, labs, lobbies and department workgroups. It enables SMB networks to support Voice over IP (VoIP), streaming media, multicasting, security, and many other bandwidth-intensive applications like ERP and large file transfers. The GS108T comes with a comprehensive set of features, such as access control lists (ACL), 802.1x port authentication, enhanced QoS, rate limiting and IGMP snooping among others to provide a small or medium-sized business with a network that is geared for growth while ensuring performance and reliability. 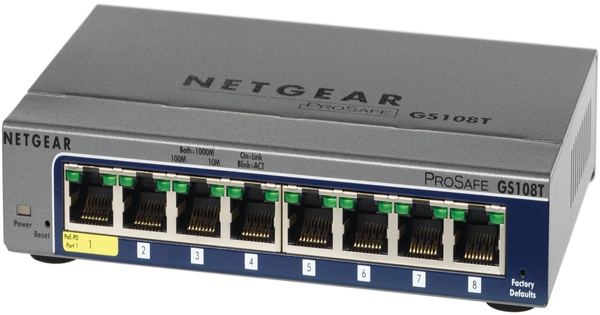 In addition, the GS108T supports IEEE 802.3af standard for Power over Ethernet (PoE). It can obtain its power from either a PoE source or from an external AC power adapter. This gives an SMB flexibility when installing the switch in places where a power outlet is not present. The GS108T comes with an intuitive, Web-browser interface which offer simple Smart Switch management, making it a snap to monitor switch performance, configure ports, even set up port trunks, VLANs, and traffic prioritization. Alternatively, you can use SNMP-based software to manage your Smart Switch. NETGEAR ProSafe Smart Switches are ideal for adding basic management to your unmanaged networks or extending your managed networks. The GS108T provides cost-efficient solutions that enable SMB customers to better manage their network. Included are performance monitoring, port configuration, VLAN for traffic control, link aggregation for increased bandwidth, IGMP snooping for facilitating multicast applications, and Class of Service (CoS) for traffic prioritization. - ACL filtering to permit or deny traffic based on MAC or IP addresses. - Packaging manufactured with at least 80% recycled material.